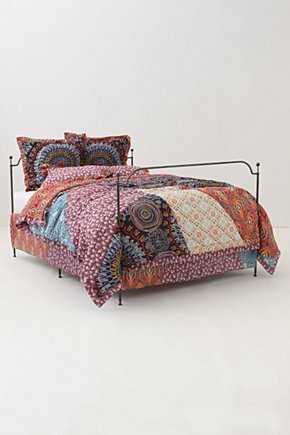 We got this bedding on sale today at Anthropologie, along with some new accessories & decor for our bedroom. Our old decorative pillows are being reworked throughout the house. Hooray for redecorating! Love! Beautiful! I'm envious. And I love your "Comments are fun. Leave one if it's nice." It's gorgeous-can't wait to see how you guys put it all together! hope your first day at work went well. can't wait to hear all about it! that bedding is gorgeous. i do love anything from anthropology!! i almost got a new duvet cover from a gal i know that she got from anthro and didn't want, but then she said she couldn't find it...i almost cried...but, i can be happy for you right? I'm so jealous! I love everything from antropologie! I can't wait to see your changes for spring! I love anthro housewares! I love just walking through the place to become inspired. =) and can't wait to see pictures! Very lovely! Anthro bedspreads are the BEST! I wouldn't want to get out of bed ;) & if you can't find a bed skirt, you could always make your own to compliment! Great bedding! I've been DYING for bedding from anthro forever, but I just can't make up my mind about which one I'm more in love with. Every time I start to look, I find another that I'm even more in love with. that sounds like fun to do! I need to get my booty home today and do some more revamping. Can't wait to see the new look! Lovely! It's always so much fun to redecorate! yay! that is gorgeous!! working at anthro definitely has its perks :) i think i may take advantage of the friends & family sale going on (my cousin is a manager at the san diego store). i too have been obsessed w/ redecorating lately.. you need to mix it up once in awhile!